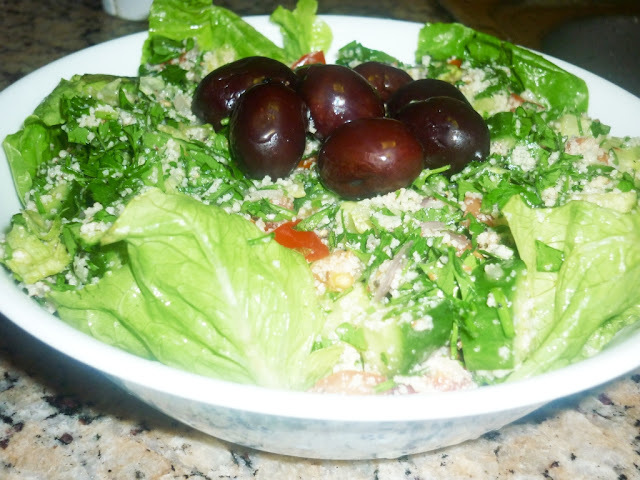 Tabouli is very healthy Arabic salad using Parsley leaves as main ingredient along with cracked wheat( burgol),olive oil,garlic ,mint leaves and other ingredients.Parsley leaves are rich in anti oxidants,vitamins and fibre.Medical science say that this magic herb helps in controlling blood cholesterol. Mix all vegetables with salt and lemon juice.Drizzle Olive oil and add burgol and toss well. Try this and enjoy this awesome salad .Don't forget to send your comments!